A motor-branch circuit is a wiring system extending beyond the final automatic overload protective device. Thermal cutouts or motor overload devices are not branch-circuit protection. These are supplementary overcurrent protection. The branch circuit represents the last step in the transfer of power from the service or source of energy to utilization devices. NEC® 430, PART IV – The code requires that branch -circuit protection for motor circuits protect the circuit conductors, the control apparatus, and the motor itself against overcurrent caused by short circuits or grounds (sections 430.51 through 430. 58). Fuses or circuit breakers are the most common protectors used as branch – circuit protective devices. These protective devices must be able to carry the starting current of the motor. To carry this current, they may be rated 300 or 400 percent of the running current of the motor, depending on the size and type of motor. Motor controllers provide motor protection against all ordinary overloads, but are not intended to open during short circuits. Motor-branch circuits are commonly laid out in a number of ways. Figures above show couple of motor-branch circuits and how the circuit protection is used in various types of layouts. As mentioned before, the motor-branch-circuit short-circuit and ground-fault protective device must be capable of carrying the starting current of the motor. For motor circuits of 600 volts or less, a protective device is permitted that has a rating or setting that does not exceed the values given in Table 430.52 of the code. 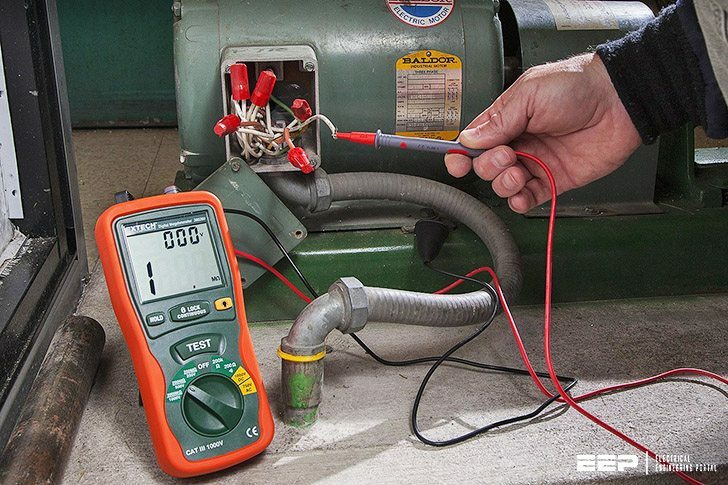 Describe the purpose and use of portable electrical tool testers. Describe maintenance procedures of power tools. Describe the purpose and use of test equipment. Describe the different types of motors and controllers. Identify the components of motors. Identify the different components of a DC motor and controls. Identify the different components of an AC motors and controllers. Describe the construction of three phase motors. Describe the functions of AC motor controllers. Describe the different types and protection of motor branch circuits. Describe the procedures associated with equipment grounding. Describe the different types of control circuits. 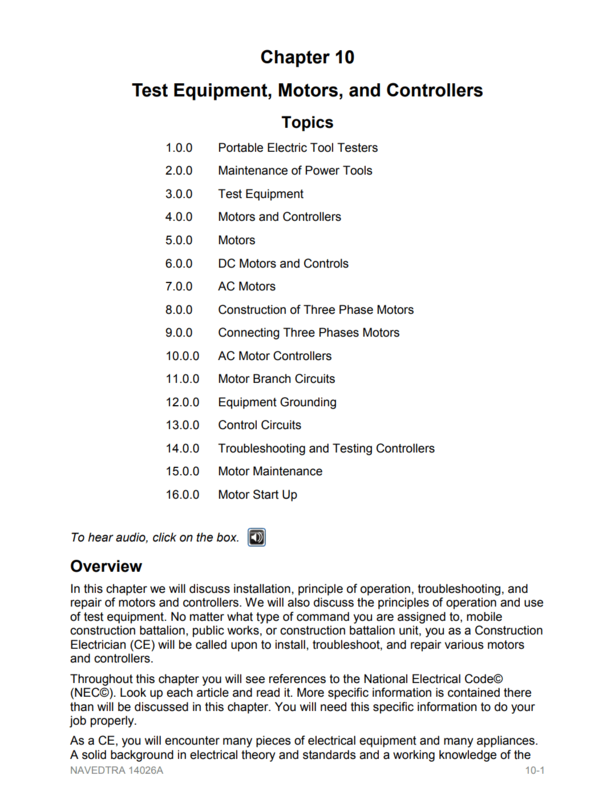 Describe the procedures associated with troubleshooting and testing controllers. Describe the motor start up procedures.